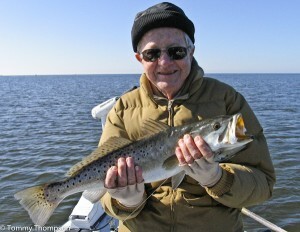 There’s no doubt that the spotted seatrout is the most popular of all the game fish we catch along our Big Bend coast. These fish are plentiful, relatively easy to catch, and make fine table fare. With the season now open all year, a daily bag limit of 5 fish (all over 15-inches; one over 20 inches) will easily feed a hungry family of four. In the fall months, when the weather’s not COLD, but COOL, you can expect to find hungry trout all over the 3 to 6-foot grass flats that run along the coast of Natural North Florida. Beginning at Yankeetown, in Levy County, huge expanses of grass extend all the way to Panacea in Wakulla County. This makes EVERY port in our region a hot spot for seatrout. If your adventure takes you to Cedar Key, Suwannee, Horseshoe Beach, Steinhatchee, Keaton Beach, Econfina or St. Marks, you’ll find plenty of trout. Cool-weather seatrout have been eating all summer, and are generally larger than those caught in warmer months. Cool-weather trout are hungry because they know the cooling waters signal the coming of winter. They also need to fatten up in order to spawn in the COLD winter months, when water temperatures dip into the 50’s. But the fact that they’re hungry doesn’t mean they’ll approach and attack your bait with the same vigor that they do in the summer months, in deeper water. Slow-moving baits work best, as seatrout, like other cold-blooded creatures, just don’t move very fast. If you fish natural bait, try live pinfish, finger mullet or shrimp under popping corks. But don’t over-do the popping. If you like to throw plastics or Gulp! baits, put them on a light jig head and bounce them slowly along the edges of sandy holes in the grassy flats. And if you’re a fan of tossing plugs, try slow-moving and slow-sinking MirrOlure Catch 2000’s, MirrOminnows, or Paul Brown Originals. Fishing is a relaxing pastime, and there’s nothing more relaxing than a day of fishing using slow-moving baits for a limit of fat fall seatrout.